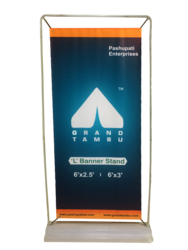 Pioneers in the industry, we offer banner stand, door shape banner stand, x banner stand, roll up banner stand and l banner stand from India. Our firm is well-known in the market for offer wide range of Shape Stand for our esteemed patrons. Designed by using premium quality raw material and advanced cutting-edge technology in order to satisfy requirements of clients. Our products are exclusively in demand for qualities such as classy look, superior finish and elegant design. Door Shape Banner Stand is a heavy-duty Advertising solution which allows you to promote your business in outdoors without worrying about wind. 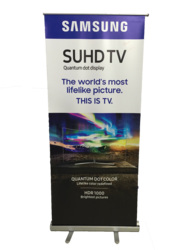 We are well-known in the market for manufacturing, supplying a wide range of X Banner Stand. The X Banner Stand we offer is very presentable and best for promotion. 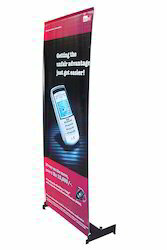 These X Banner Stands are very strong in structure and can put up a large number of people at a time. Clients can avail them at very reasonable prices and as per their specification. 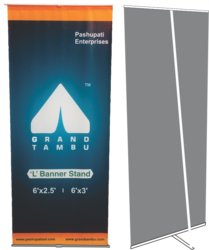 Roll Up Banner Stand can be used in conferences, retail and shopping malls, brand activations, at exhibitions for additional branding and attractive stall design. Our firm is well-known in the market for offering a wide range of L Shaped Stand for our esteemed patrons. Designed by using premium quality raw material and advanced cutting-edge technology in order to satisfy requirements of clients. Our products are exclusively in demand for qualities such as classy look, superior finish and elegant design.